I met a lot of interesting people at Bar Zuka in Ibiza over the years, one of them being Iain Stewart author of Rough Guides to various countries in the world. He got in touch recently and said I really must read this book, written by Damien Enright, on the early scene in Ibiza at the beginning of the ’60s. I duly did, and liked it so much I got in touch with the author and told him how much I enjoyed it. After a few emails Damien kindly agreed to the interview below. Enjoy! Hi Damien, how are you? I’m feeling extremely well thanks. I’m based in West Cork, Ireland. To use that cliched term, its ‘iconic’, when the weather is good there is almost nowhere on earth that’s as nice, and I’ve looked at a lot of places. It’s the people that make it here, the people are lovely, I’ve not had a cross word with anyone in twenty years. What was your first impression of Ibiza? My first impression of Ibiza was that it was sort of a heaven on earth. When I got off the boat in 1960 there were a group of raggle taggle people sitting around the Domino bar almost opposite the gangplank. I wandered over to do the usual when you arrive at a place, you look for anyone that’s vaguely recognisable as your sort of person, and you ask them questions like ‘where can i get a cheap hotel?’, ‘can houses be rented here?’. I was immediately involved with a group of people who were laughing, drinking, babbling and having fun, and I was immediately ‘a person of interest’. Ibiza was very isolated then, so the appearance of a foreigner coming down the gangplank was a bit of a novelty. You could tell them news from the outside world and you would have some new input into the conversation, so I loved it immediately and thought ‘this is the place for me’. Ibiza seemed to be the end of the earth, dusty and run down and full of really fun and interesting people. The locals seemed very nice and friendly too. Theres always been a strong association between music and Ibiza. 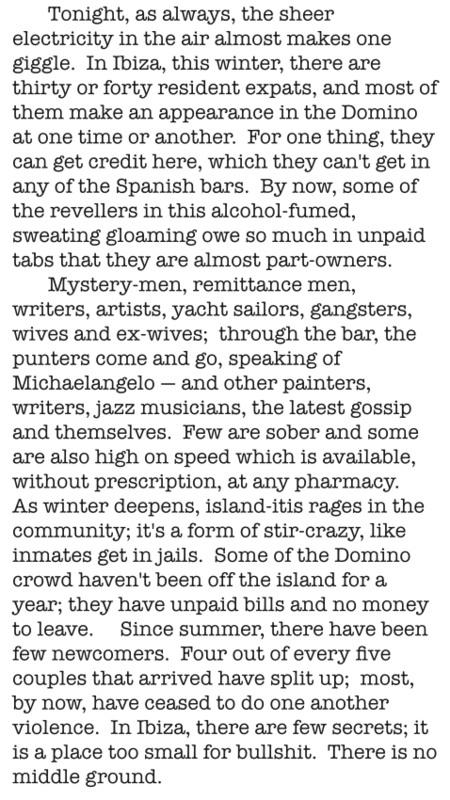 The owners of the Domino bar sound like they had a pretty amazing jazz collection. Can you remember many of the records you heard there and what kind of clientele frequented the bar? There were three owners of the Domino, well who had leased it anyway. One of them was French Canadian – Alain Bleu, there was an Englishman called Clive Crocker, who seemed to have come from a rather genteel background, and then there was Dieter the German. Dieter for some reason, seemed to have an incredible connection in getting the latest jazz albums from America, they were posted or given to him or whatever. So we had Charlie Mingus, Coleman Hawkins, Billie Holiday, Sarah Vaughn, Ella Fitzgerald, Miles Davis ‘Sketches of Spain’, his ‘Concertio de Aranjuez’ was perfect for a beautiful sunset, John Coltrane, Albert Ayler… That sort of thing. There were real aficionados of jazz there, people who really knew a lot about it which I didn’t, but the music blasting out of there was absolutely brilliant. 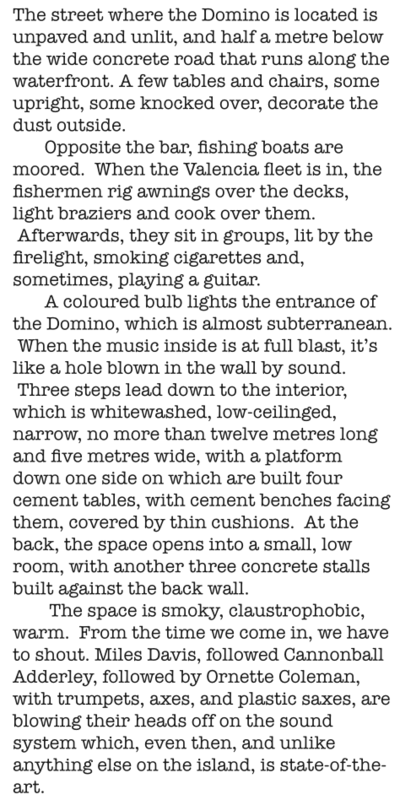 It was perfect for the ambiance of this semi-cave with a lot of cigarette smoke, really cheap booze and very interesting characters hanging around. A perfect milue for a jazz world, you know, the demi monde. There were people like Walter Benjamin and Laurie Lee who had written accounts about life in Ibiza before, but ‘Dope in the Age of Innocence’ was the first detailed account that I’ve read of life at the beginning of the counter culture that we’re still living now to some extent. Were you aware that you were involved in something so important at the time? Well I think so, because I had some experience of the bohemian world in London, pubs like Finches on the Fulham Road and in Soho places like the Partisan Coffee Bar and the French pub with people like Padddy Kavanagh, Anthony Kronan, Francis Bacon, but they were like a very different set. I could see that Ibiza was almost harking back to the bohemian world of Paris in the twenties that you heard about, with all the greats hanging out around the bars. But the really big difference was when all the drugs came along, then I really felt like I was living at the cutting edge of something. It hadn’t happened before and there were only a few people who smoked dope in Ibiza, somebody turned me on for the first time in 1961, and what we talked about was very different from any kind of conversations I’d had before. A lot of these people, well the few that were there, had read a bit, books like Aldous Huxley’s ‘The Doors of Perception’ and Oupensky’s ‘The Fourth Wave’, it did feel like something new was happening. So ‘Dope in the Age of Innocence’ really does express that period. We were very innocent of any commercial aspect to it, like getting into dope dealing. We really felt like this was going to change us for the better and, disseminated enough, it would change the world. Because all the problems we had were in our heads, all due to our acquisitiveness and material predisposition, if we could clear some of that out and get back to what was really real and important, we felt that dope could really help us do that, you know? Later on there seems to be a lot of experimentation with LSD, this drug in particular seems to have had a big influence on you. First of all I had a difficult time with a broken heart when I split from my first wife. Ibiza was very hedonistic, most of the people there were in the boozing fraternity, drinking like crazy. A lot of them were American – writers and painters – getting at one another. We got very fed up with this and then somebody gave us some Sandoz acid, myself and Hannah my partner at the time, and it just swept us away into a really beautiful experience. We decided that all this crap in Ibiza, drinking all the time, going out at night, was just all getting a bit too much, lets go somewhere like a different world, this world we’ve just been in all night. And that place was Formentera. So we got a boat over there, and it really did have a big impact on my life. I was bought up a Catholic, but divorced myself from that in my early twenties, but when I was young I did have a real inclination and awareness of a spiritual dimension, and still feel that way about everything around me. I write about nature now a great deal, every week in fact, as well as a number of well received books, so LSD probably had some influence on my perception of the world around me, and alerted me to time and the ephemerality and depth of time. It was very good acid we did of course, Sandoz straight from Switzerland, and frankly we didn’t do a lot of tripping. We never went out tripped in a discotheque, well there weren’t any around anyway. There was no such thing as saying lets have a few vodka slammers, top up the acid, go to a club and do some coke to keep us awake. There was none of that. We went out into the farm house in the country, put some food on, it wasn’t a party it was just you and your partner and a couple of friends. We treated it with huge respect, almost like a sacrament, and that aspect of it has remained with me, and certainly did me no harm (well some people may have a different opinion!). When was the last time you visited Ibiza / Formentera? Well it must have been about four years ago. I couldnt go back to Ibiza for many years, as anyone who has read the book will understand. I left Spain via the Pyrenean route, and could not return. I tried to get back there by going to a lawyer and finding out what could be done, but he advised me very strongly against ever returning to Spain. But eventually I could go back. I visited in the eighties and twice since then, and when I returned it was an absolute shock. Ibiza town was totally different. It had bars, clubs, loud music and people were actually there on holiday. When I was there people didn’t come on holiday, they came to live and work there with almost no money at all, so now it seemed very commercial. But I did have a strange experience there. I went to see my old friend Chris Smith, who was my saviour when I was on the run in Ibiza, and we went to find the Domino bar. Chris has lived there practically all his life, so we went along the waterfront and we found the little door, down a few steps because it was almost underground. There was this small window cut into the door with an iron grill, we put our fingers through it and pushed the wooden shutter, it went back and we could see the darkness inside. We started acting the fool saying ‘hey Angel man… put on Mingus…’ when suddenly we felt a presence behind us. It was a very large Spanish man, and he asked us ‘que pasa?’ I said, ‘oh we’re just calling up old friends’… Chris and I both speak good Spanish, so there was no problem with communication, and we told him we both used to come here in 1960/1, and he asked us if we wanted to go in. We said yes of course, so he got us the key and we were able to go inside this ghostly interior, which is condemned now because the sea used to come up through the toilet and so on. We were able to walk amongst the ghosts, because everything was the same, it was a great experience. I went out into the country to stay with Chris, and that was pretty much the same, but the town mileu is radically different. Formentera has changed of course too, but then nothing stays the same. I enjoyed reading the book immensely damien. I hope theres a sequel coming, I need to know what happens to everyone next! 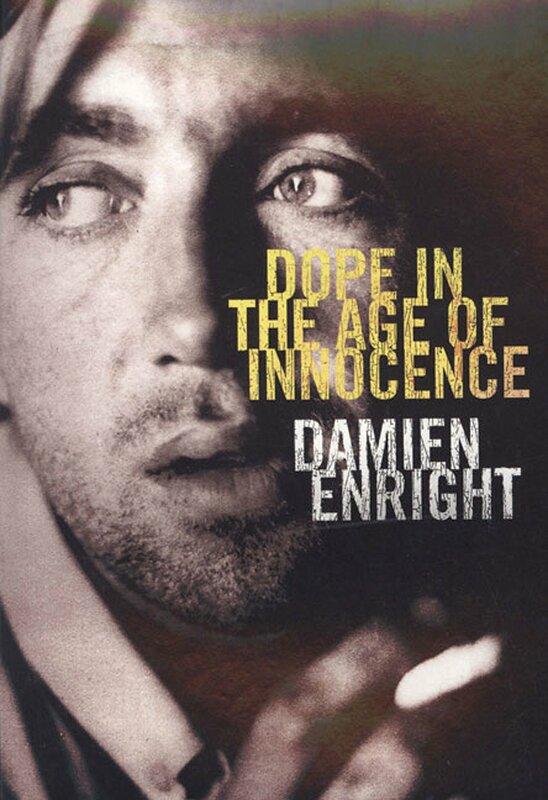 Damien Enright’s ‘Dope in the Age of Innocence’ is published by Liberties Press and available now.